The creation of the plan has at times been contentious, indicative of the fraught nature of virtually any community planning process and the high stakes involved in addressing affordability, transportation and other crises facing many neighborhoods across New York City. The effort was organized by local City Council Members Antonio Reynoso and Rafael Espinal with Brooklyn Community Board 4 and a variety of other stakeholders. At the release event on September 22, U.S. Rep. Nydia Velázquez told the more than 200 people who packed into the cafeteria of the Academy of Urban Planning to learn the details of the plan that the development of the community plan was an example of democracy in action. “You will empower our member of the City Council, Reynoso, to go to the city and say, ‘This is a community-driven rezoning plan – and this is how it should be done,’” she said. 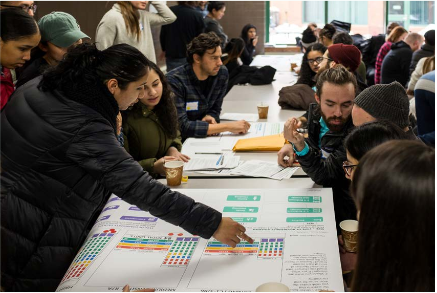 The Bushwick Community Plan includes a number of goals – including slowing displacement, preventing out of character development, and supporting both small- and large-scale manufacturing businesses – and is being presented from the community and its leaders to the Department of City Planning as it begins to evaluate the area for changes to land use rules and new city investments, similar to processes that have taken place in areas like East Harlem. Like several others the de Blasio administration has rezoned already, including East New York and the Jerome Avenue corridor in the Bronx, Bushwick is home to many low-income people of color at risk of housing displacement. But more like East Harlem and Inwood, Bushwick has already seen significant gentrification and locals are concerned about how the pace has accelerated without a coherent plan. The comprehensive 74-page community plan covers six areas: land use and zoning, housing, economic development, community health and resources, open space and transportation and infrastructure. Under land use and zoning, the key issue, recommendations include not allowing areas currently zoned for manufacturing to become residential unless certain requirements are met; allowing higher density development in some cases when it will increase the number of affordable housing units; and proposing historic districts as well as individual landmarks throughout the neighborhood. The plan also calls for increased funding for anti-displacement legal services, the creation of a program that would incentivize homeowners to keep rents affordable in their buildings, more sanitation funding for commercial corridors, and improving Maria Hernandez Park and Irving Square Park, the two largest parks in the neighborhood. But at issue is how feasible the plan is, how the de Blasio administration approaches its efforts to rezone and invest in the area, and how far Reynoso, Espinal, and their partners can push the city to adopt the community’s vision. The Department of City Planning may use the community plan as something of a guide as it designs a rezoning proposal, but it remains to be seen to what extent the community proposals shape the process, which will ultimately come to a vote before the City Planning Commission and the City Council, where Reynoso and Espinal will have outsized sway. Bushwick residents, both for and against a rezoning, worry about how the city might mangle or ignore the plans altogether. Under current land use rules, otherwise known as zoning, significant new development is allowed in Bushwick without consideration of affordable housing or the aesthetic character of the neighborhood. There are many properties that have extensive as-of-right powers, meaning developers can build taller buildings without any real negotiation with the city for community benefits. One such property is near the Myrtle-Wyckoff transit corridor, where developers plan to build a 27-story tower with retail space, office space, and 400 apartments, according to the minutes from a February meeting of the community board’s Housing and Land Use subcommittee. That particular high-rise wouldn’t be allowed under the zoning rules that are being proposed as part of the Bushwick Community Plan, according to Community Board 4 District Manager Celeste Leon. In 2013, concerned by overdevelopment happening in nearby neighborhoods, members of the community board wrote a letter to then-City Council Member Diana Reyna seeking to explore the idea of rezoning Bushwick. The goal was to preserve the character of the community. In particular, preventing taller buildings, which have been referred to as “middle finger buildings,” from being wedged in between two- and three-family homes, according to current Reynoso, who succeeded Reyna in 2014. “Affordable housing would have been icing on the cake,” Reynoso said in a late August interview. After his election, Reynoso, along with Espinal, who took office the same year after moving from the state Assembly, initiated the Bushwick community planning process, an effort to allow residents to democratically design a rezoning plan that would best suit their needs. Over the course of the next several years, the steering committee – comprising of more than 200 participants, including the members of the community board, organizations like immigrant-advocacy group Make the Road New York, the RiseBoro Community Partnership, and Churches United for Fair Housing, as well as 21 individual Bushwick residents – held a dozen workshops, town halls, and other issue-specific meetings. Planning this way is time-consuming and complicated, but the process allows for many voices to be heard, Reynoso said. Shortly after Bill de Blasio was elected mayor, he put forth an agenda to rezone 15 different neighborhoods throughout the city in an effort to create more housing, especially affordable housing, and infuse communities with new resources, in part to handle an influx of new residents. His predecessor, too, used rezoning to manage development in New York City, though with a somewhat different lens: during his three terms, Michael Bloomberg oversaw more than 100 rezonings. Before de Blasio began to move through his rezonings, he worked with the City Council to pass significant changes to the city’s land use rules, including Mandatory Inclusionary Housing, which requires developers to include certain percentages of affordable housing in new buildings that receive a city variance to build denser. Bushwick was not on de Blasio’s original list of neighborhoods, but city officials have been closely involved as the community has crafted its plan and appears ready to move into its planning process. The city will hold its own listening sessions and do its own studies, then release its own initial plan. 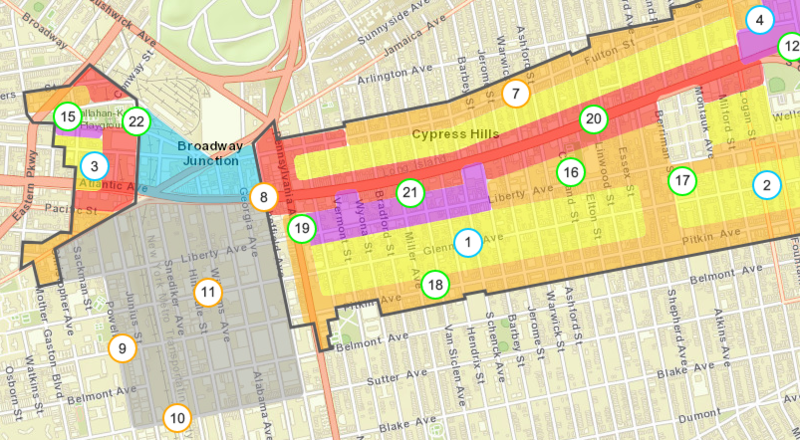 Once the Department of City Planning certifies a Bushwick rezoning application, the Uniform Land Use Review Process, which takes roughly seven to ten months, begins. After the community board offers its advisory vote, the plan moves to the borough president for review and additional nonbinding feedback, then the City Planning Commission for formal approval, followed by the City Council for final say. Throughout the process, local leaders, especially the City Council member(s), typically continue to negotiate with the mayoral administration to make tweaks to the city’s proposal and secure additional investments. As in most rezonings, at issue in Bushwick is that the mayoral administration’s interests may not be in line with the community’s. One example is the neighborhood’s manufacturing zones. Bushwick is known for its old factories and warehouses, which developers often eye as potential for new residential space. The community plan would oppose changing most manufacturing zones to residential zones unless special conditions are met. That is one point the city has tried to ignore, said Leon, the community board district manager. Another example: at a February meeting, Winston Von Engel, the Brooklyn director of the Department of City Planning (DCP), reportedly told Bushwick residents that the city was interested in preserving the aesthetic character of the neighborhood, more so than preventing displacement, according to several residents who were present. Von Engel later told the Bushwick Daily that he had been misinterpreted and that there should be a balance between preservation and expansion. Activists like Rodriguez oppose the rezoning entirely. Michael Higgins, a member of the Brooklyn Anti-Gentrification Network, said that the plan itself could cause Bushwick residents to panic, from which landlords can then benefit. He said the community has more leverage when individual properties are rezoned, rather than whole swaths of a neighborhood, because residents have the opportunity to negotiate requests like more affordable housing and community space. Tom Angotti, professor emeritus of Urban Policy and Planning at Hunter College and the author of “Zoned Out! Race, Displacement, and City Planning in New York City,” said he understands the skepticism over the rezoning. There have been no citywide studies that explain the relationship between rezonings and gentrification, but individual case studies do show that zoning changes lead to displacement, particularly in low income communities and communities of color, Angotti said. Reynoso acknowledges the community’s concerns, but said that Bushwick’s geography, as well as the way it is built out, leaves fewer opportunities for growth compared to other neighborhoods around the city, referencing the recently-passed Inwood rezoning, which drew criticism from local housing activists concerned about density, neighborhood character, and gentrification. But Inwood, Reynoso said, encompasses waterfront property that the city could capitalize upon. New development of that nature just isn’t possible in Bushwick. The Bushwick plan envisions growth near transit hubs, but otherwise is mostly designed to downzone the neighborhood, Reynoso said, and disallow large new residential buildings. That’s true, Angotti said, but that still doesn’t mean the Bushwick Community Plan will prevent displacement. He points not so much to the community plan itself, but to the Department of City Planning and the City Planning Commission. Angotti said the city has rejected every community-based rezoning proposal of which he is aware over the last 25 years. In a statement, the agency did confirm that rezoning applications, even those by city agencies, are usually changed during the public review process. Jose Lopez, the co-director of organizing at Make the Road New York, has been heavily involved with the Bushwick Community Plan, serving on its steering committee. He recognizes that DCP will craft its own proposal for the ULURP process, but has some hope for the influence that the community plan may have. Reynoso said that the discretion and authority to rezone really lies with the City Council, not with any city agency, and “the Council member’s job is to advocate on behalf of the community” – which he plans to do. Typically, when the City Council votes on a rezoning plan, the expectation is that the Council will vote to support what the local City Council member(s) – in this case, Reynoso and Espinal – want. Yet, in May, City Council Speaker Corey Johnson said that his approach is “deference” but “no veto” for Council members on land use matters. Robert Camacho, the chair of Community Board 4, has been involved with the planning process since the beginning. He said he is satisfied with the final plan, but does worry for its future. Bianca Fortis is a Brooklyn-based freelance journalist. On Twitter @biancafortis & @GothamGazette. Sally Goldenberg, a senior reporter for Politico New York currently covering housing and real estate, joins the podcast to discuss Mayor de Blasio's approach to neighborhood rezonings and affordable housing, among other topics. 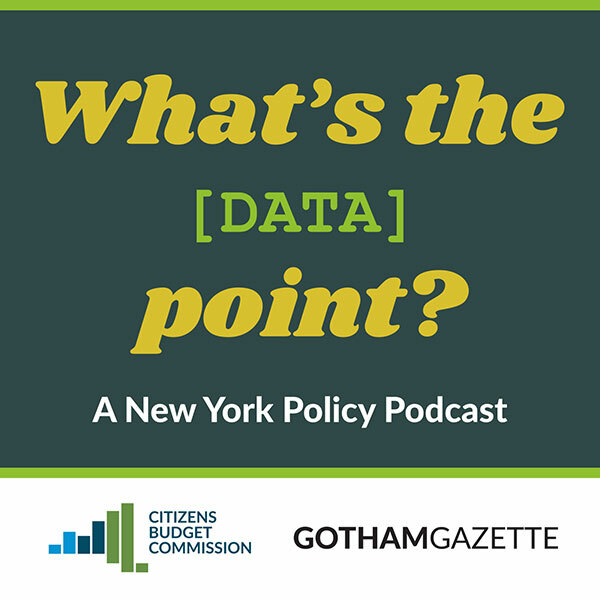 The episode's data point, 4, is the number of neighborhood rezonings that have been passed so far under de Blasio: East New York, Downtown Far Rockaway, East Harlem, and the Jerome Avenue corridor in the Bronx. We discuss those, as well as proposals that have not gone through, new project and rezoning ideas on the table, and much more. With a good deal of experience covering City Hall, city politics, budgets, and now housing, this week's guest brings a great deal of expertise to the discussion. Anita Laremont is the general counsel and chief data officer at the Department of City Planning, where major decisions are made around how land is used in New York City. Laremont joined the podcast to discuss some of the significant projects and changes that City Planning has ushered through over the past several years, including historic changes to the city's land use rules meant to spur affordable housing, neighborhood rezonings, and why the city doesn't have a master plan. Michelle de la Uz is a commissioner on the City Planning Commission, where she was originally appointed by then-Public Advocate Bill de Blasio, and Executive Director of Fifth Avenue Committee, a Brooklyn-based nonprofit that manages affordable housing projects and provides other services to low- and moderate-income New Yorkers. De la Uz has been an independent voice on the City Planning Commission, regularly voting "no" on major proposals coming from de Blasio's administration. She joined the podcast to discuss the current housing crisis in New York City, the mayor's approach to development, and more. Listen to the full conversation and let us know what you think -- we're on Twitter @TweetBenMax and @JarrettMurphy and guest Michelle de la Uz. You can listen to the episode through the embedded audio below or download the episode wherever you get your podcasts. 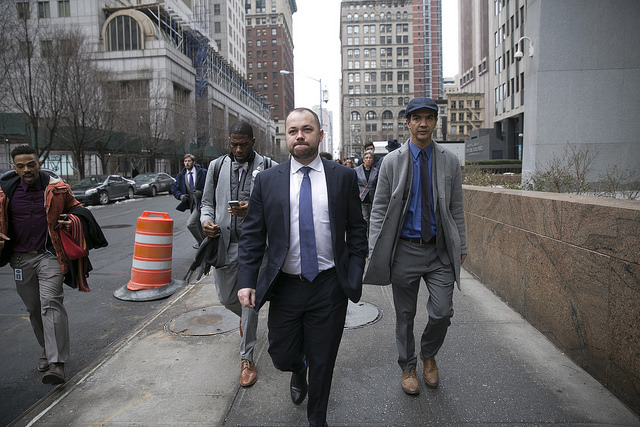 City Council Speaker Corey Johnson said Thursday that the elected Council members of the body he leads will get “deference” but “no veto” on land use matters. Even before he was officially elected the new speaker of the Council, Johnson had already begun to define how he would approach the job. In clear breaks from his predecessor, Melissa Mark-Viverito, Johnson promised greater independence from the mayor, expanded oversight over city agencies, and a more active role in land use decisions, which is one of the most significant roles played by the 51-member legislative body. Promising to bolster the Council’s land use division with more resources and staff, Johnson seemed to want a heavier hand in local development projects, or land use applications, where the previous speaker tended to almost completely defer to the local Council member’s sentiments and negotiations. Johnson, however, has implied that he won’t allow the same kind of leeway that Mark-Viverito gave to members to oppose or reject proposals in their districts, which, under Mayor Bill de Blasio, include a number of neighborhood rezonings that can shape the landscape and character of neighborhoods for generations. At an event Thursday, hosted by the Center for Community and Ethnic Media at the CUNY Graduate School of Journalism, Johnson explained his approach, saying that he would involve himself in land use applications if a local Council member requested it, but at the same time, would not allow any single member to act as an obstacle to a worthwhile project with benefits for a community. When asked about the ongoing land use process for a proposed rezoning in Inwood in Uptown Manhattan, Johnson first admitted that he knew little about the ins-and-outs of the particular plan. “On the Inwood rezoning, this is not me in any way shirking, but I honestly, I haven’t been briefed on it,” he said, when panellist Debralee Santos from the Manhattan Times asked him about his general approach to land use issues and specifically two rezonings, a recently completed one in the Jerome Avenue corridor in the Bronx and the ongoing one in Inwood in Council Member Ydanis Rodriguez’s district. In the past few years, the City Council and the de Blasio administration have come face-to-face with the fact that even with rezonings that invest hundreds of millions of dollars in a neighborhood, that have gone through months of negotiations and received hundreds of hours of testimony and feedback from communities, there are inevitably those who remain dissatisfied. In some cases, Council members capitulate to community backlash, killing a project, but often they do not. For instance, in 2015 East New York became home to the administration’s first successful neighborhood rezoning. Despite Council Member Rafael Espinal negotiating commitments of more than $260 million in investments from the city as well as a slew of other community benefits -- besides the affordable housing and economic development that undergirded the rezoning -- a segment of housing advocates argued that the rezoning would continue, and exacerbate, the nascent gentrification of the district. (The advocates even threatened to organize a challenge to Espinal’s 2017 reelection bid but did not follow through.) Espinal approved the project in the end, claiming advocates did not recognize the quality of the deal coming to the long-ignored community. But, in 2016, owing to vocal community resentment, Council Member Rodriguez announced his opposition to a proposed development, also in Inwood, the day before it was scheduled to be voted on by the Council’s land use committee. The project was unanimously rejected by the committee based on Rodriguez’s verdict. It was different, however, for Council Member Laurie Cumbo, who faced widespread criticism for vacillating on the proposed redevelopment of the Bedford Union Armory in Crown Heights. Eventually, faced with angry residents and a strong primary challenger, Cumbo rejected the proposal before her, which forced the city to amend its plans to later have them approved. On Thursday at CUNY, Santos pointed to the Inwood Library as one controversial aspect of the larger rezoning, where residents of the neighborhood have called for an entirely separate land-use application for the building. “That’s a local institution that people believe should merit its own process altogether, its own ULURP [Uniform Land Use Review Procedure],” Santos pointed out. Johnson recounted his own experience with the rezoning of Pier 40 in his Manhattan district in 2016, where in the end, he managed to extract $100 million worth of investments from the city while creating affordable housing and senior housing. “I worked on it for two-and-a-half years. There were many places where I wanted to walk away from that rezoning, it was frustrating me so much that I didn’t think I’d be able to close the deal. But in the end, I always work to get to a place of ‘yes,’” he said. 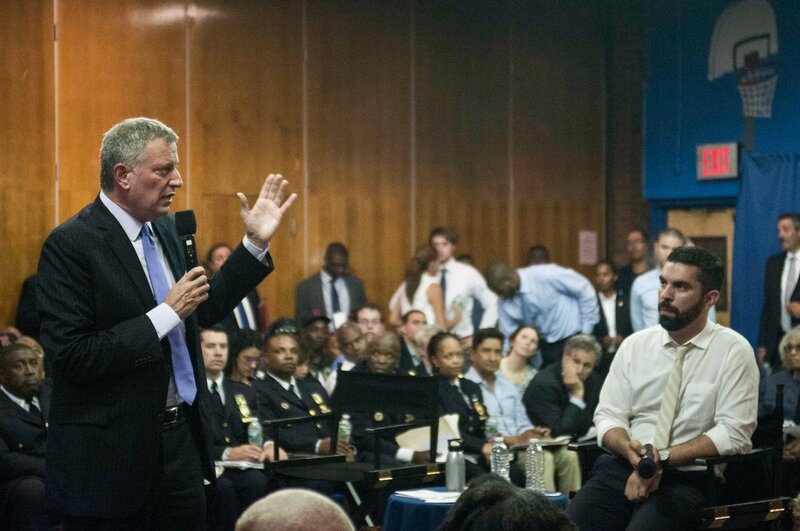 Would he get similarly involved in the Inwood rezoning, Santos asked. “If I’m asked by the local elected official,” Johnson said. It’s unclear to what extent Johnson will assert himself if asked by other parties in a negotiation, such as the mayor’s office or real estate developers. Though Johnson said he was not up to speed on the Inwood rezoning, in a statement to Gotham Gazette, Council Member Rodriguez indicated he is pleased with the speaker’s support thus far in the process. Later this year, the Department of City Planning is slated to release a “draft planning framework” as part of a process to rezone Gowanus, an initiative spearheaded by Brooklyn City Council Member Brad Lander aimed at increasing affordable housing and making a variety of other neighborhood improvements. Rezoning Gowanus, a middle-to-upper income, majority-white neighborhood, would be a departure from the city’s prevailing approach to reimagining a number of neighborhoods across the city. At the beginning of his mayoralty, Bill de Blasio set an objective to build or preserve 200,000 units of affordable housing in the city, a goal that has since been expanded to 300,000 by 2026. To that end, de Blasio listed about ten neighborhood to rezone, the central purpose of which is to permit added housing density. 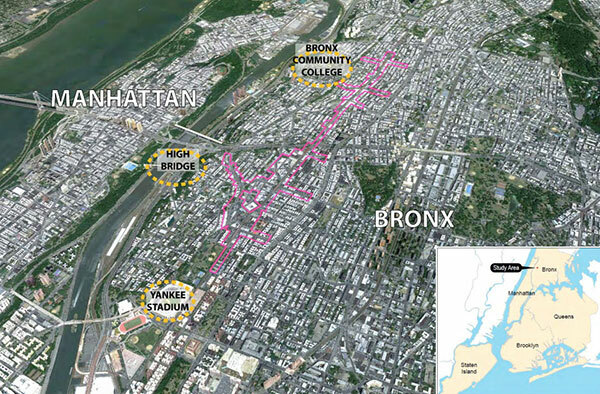 The community-wide plans that have moved forward or are on the verge of passage through the City Council thus far have include lower-income communities: East New York, East Harlem, and the Jerome Avenue corridor in the Bronx. Downtown Far Rockaway was also rezoned, and plans are moving ahead for Inwood and on the North Shore of Staten Island. The rezonings include changes to an area’s land use rules, typically allowing for taller residential buildings that must include a certain set percentage of affordable housing units, and promises of amenities like new schools, improved street designs, and other community benefits. But from the start, questions have arisen around which neighborhoods are chosen for such major changes, and whether those changes accelerate forces of displacement for current residents. A City Limits analysis of East New York, East Harlem, and the Jerome Avenue corridor found that 85 percent of the residents included in the rezoning areas are black or Latino and over 50 percent of the households take in less than $35,000 annually. Far Rockaway and Inwood are in line with demographic profile of the three main, larger city-led rezonings. Asked by Gotham Gazette about the pattern of his administration’s rezonings falling in lower-income neighborhoods, de Blasio said in February that the sample size of the rezonings is small, so no sweeping conclusions could be drawn from the pattern. He also reiterated his view that low-income communities are the ones that are most suitable for increased development. De Blasio went on to insist that his rezoning plans have been focused on increasing affordable housing stock wherever the opportunity presents itself. While de Blasio has pushed through different elements of the zoning packages, including the mandatory affordable housing attached to any upzoning, in something of a surprise, de Blasio’s practices have tracked with that of his predecessor, Michael Bloomberg, in terms of the neighborhoods tabbed for such increases in density. A 2010 Furman Center for Real Estate and Urban Policy study of the rezonings under then-Mayor Bloomberg, for example, found that rezonings in areas with whiter than average populations were more likely to retain restrictive zoning ordinances. In turn, the city allowed comparatively more density in rezonings in black and Hispanic neighborhoods. 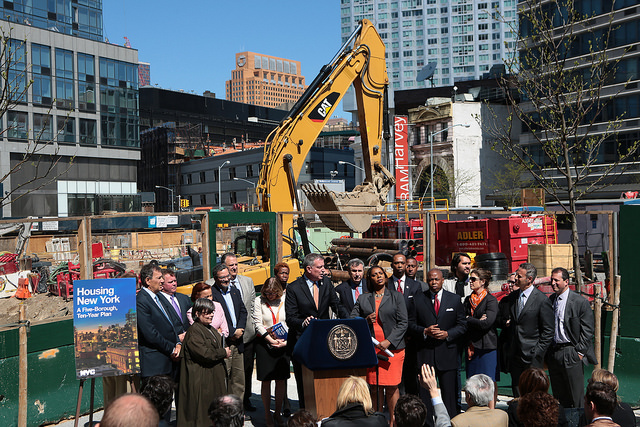 Nevertheless, the de Blasio-led rezonings, which do include many more safeguards for communities than Bloomberg’s, have been embraced by many local elected officials, especially those who’ve been able to negotiate for more local investments from the city. The de Blasio rezonings, however, have also been met with resistance from various affordable housing advocates and some elected officials. In an interview with Gotham Gazette, Katie Goldstein, executive director of affordable housing advocacy group Tenants and Neighbors, argued the city's rezonings have created housing that is nominally affordable, but in reality too expensive for the residents in certain neighborhoods. And the location selections, she said, exacerbate displacement pressures and gentrification. “What we’re seeing now is really just city-sponsored gentrification in these neighborhoods that have already been experiencing displacement pressures,” Goldstein told Gotham Gazette. For his part, de Blasio argues the rezonings will not spur out-of-character development, nor significant displacement. Instead, the mayor says, creating affordable housing in low-income areas helps to reduce displacement pressures, especially when paired with provisions that require 30 percent of the units to be built under the Mandatory Inclusionary Housing (MIH) guidelines that de Blasio and the City Council passed last term. New York City must build its way out of the housing crisis, de Blasio believes; sitting on existing housing stock will only lead to higher rents and more displacement. He also regularly reminds critics that the rezonings are not only paired with MIH, but also significant investments in eviction prevention efforts. In addition, de Blasio offers, the added housing density in rezoned neighborhoods is coupled with improvements to infrastructure, schools, parks, public transportation, job training, and more, allocating resources for the community at hand and its thousands of new residents. Furthermore, low-income neighborhoods, in de Blasio’s telling, have been underdeveloped compared to more affluent areas, as they have not been rezoned for decades. Lander, who replaced de Blasio in the City Council almost a decade ago, is helming the Gowanus rezoning, in its early stages, with community input. The process began in fall 2016 with a series of community visioning and planning meetings. As Lander has repeatedly noted, Gowanus would be a different type of rezoning than the ones de Blasio has put forth. According to the aforementioned City Limits analysis, Gowanus -- a neighborhood bordering Park Slope that shares a name with the canal that runs through it -- is over half white with a annual median income of over $65,000. Lander believes the city should not only rezone Gowanus but should make it a priority to upzone other more affluent neighborhoods throughout the city. According to Lander, loosening zoning restrictions and building affordable housing in traditionally tightly-zoned, affluent neighborhoods can help desegregate New York. Moses Gates, director of community planning and design at Regional Planning Association, told Gotham Gazette that it is not as if Gowanus is the sole low-density, tightly-zoned, middle-to-upper-income community throughout the city that could use more affordable housing. Along with Forest Hills, urban planning experts have pointed toward middle-to-upper-income, low-density neighborhoods such as Long Island City, Bayside, Midwood, and Chelsea as opportune locations to upzone. The de Blasio administration has also raised the prospect of rezoning Washington Heights, Bushwick, Chinatown, Southern Boulevard, Flushing, and, as mentioned, the Bay Street Corridor on Staten Island’s North Shore. One of the obstacles to rezoning proposals can be opposition from local City Council members, many of whom are loath to invite outcry from constituents and community boards that are often opposed to adding density close to home. Though he has made clear his philosophy is one of ‘getting to ‘yes,’’ new City Council Speaker Corey Johnson has also indicated he will continue the tradition of heeding the local Council representative’s wishes on land use matters, including neighborhood rezonings, and involving relevant community boards and other stakeholders. The City Council as a whole has the final vote to approve neighborhood rezonings, or single projects that require a land use approval process. The Jerome Avenue corridor rezoning moved through committee at the City Council on Tuesday, and will soon be voted through the full Council. The final deal reached between the de Blasio administration and local City Council Members Vanessa Gibson and Fernando Cabrera is projected to bring 4,600 new homes to the 95-block rezoned area, according to the mayor's office, and includes two new schools, about $56 million in parks investments, and other community benefits. According to the mayor's office, all housing built in the area will be affordable and subsidized in the near-term, will measures in place to ensure permanent affordability for about 1,150 of the housing units. “The Jerome Avenue Neighborhood Plan invests in communities that have never before gotten a fair shake," said Melissa Grace, a spokesperson for the mayor, in a statement. Additionally, Richards argued New York is “still a very segregated city,” a problem the city’s housing policies need to address. “We need to work toward righting that wrong if we’re going to give low-income residents an opportunity at succeeding in New York City,” he said. The City Planning Commission voted January 17 to approve a comprehensive rezoning plan for the Jerome Avenue corridor in the Bronx, putting the proposal before the City Council for scrutiny in the final stretch of the lengthy land use review process. The rezoning would follow four others ushered through by the de Blasio administration as it somewhat controversially seeks to add housing density, including thousands of new affordable units, and make other investments in mostly low-income communities across the five boroughs. The Jerome Avenue Neighborhood Plan put forth by the administration with local input envisions changing land use regulations in a 92-block area along Jerome Avenue, from East 165th Street to 184th Street, which currently comprises a mix of commercial, industrial, and residential space. The proposed plan would allow mixed-use development along the corridor with the intent of creating more affordable housing, while also funding new infrastructure, quality-of-life improvements, job creation, and economic development initiatives for the community. While a deal appears imminent and the clock is ticking, negotiations are ongoing between the administration and City Council Members Vanessa Gibson and Fernando Cabrera, whose districts span the proposed rezoning and who will have the final say in whether the rezoning is approved. Gibson, Cabrera, and Bronx Borough President Ruben Diaz, Jr. met recently to discuss the changes to the plan that they want to see before it is passed by the Council. The City Planning Commission’s approval of the plan started the 50-day clock for the Council to accept or reject the proposal. The entire body typically votes with the local Council member(s) on land use issues and has rarely overridden a member’s position. The Council’s subcommittee on zoning and franchises is expected to hold a public hearing on the rezoning on Wednesday, February 7. “It is and has been very fruitful,” Gibson said of the negotiation process, in a phone interview on Thursday. But there remain a few big ticket items that have yet to be resolved, she said, including preserving more affordable housing and expanding school capacity to deal with the expected increase in population from new housing created under the plan. As is, the plan will also preserve 1,500 affordable units, a number that Gibson wants to see increased to 2,500 to cope with the gentrification pressures that neighborhoods targeted for rezoning have come to expect. She emphasized that many affordable units currently in those neighborhoods will see their city rent subsidies expire in less than a decade, and that the administration should take preemptive action. As with other rezonings that have been approved in the last three years, Gibson expressed larger concerns about displacement of existing residents as zoning changes bring additional density and improvements to the communities along Jerome Avenue. But she maintained that, unlike other areas that have seen luxury developers quickly move in to capitalize on a proposed rezoning, Jerome Avenue will likely not see market-rate housing being built in the short term. “People are fearful, they have a right to be fearful, but the market in Jerome does not propel luxury housing right now,” she said. Gibson predicted that recent increases in the minimum wage and residents getting prevailing-wage and union-wage jobs will eventually lead them to be ineligible for deeply affordable housing as they start to earn more than 30 percent of the Area Median Income (AMI), a federal measure that includes surrounding suburban counties and the city. The New York City region’s AMI in 2017 was $85,900 for a family of three. Gibson insisted that the MIH set-asides should therefore include additional moderate and middle-income housing. “It has to be a diverse mixture of incomes, obviously with the majority of those incomes being on the lower end at 30 and 40 percent of AMI as well as set asides for formerly homeless families coming directly from the shelter,” she said. Jerome Avenue is the latest proving ground for the administration’s neighborhood rezoning efforts, which are part of achieving the mayor’s target of creating and preserving 300,000 units of affordable housing across the city by 2026. The first such rezoning, in East New York, largely set the tone, with the local Council Member, Rafael Espinal, having extracted a slew of concessions from the administration including a new 1,000-seat school and about $267 million in capital investments. Diaz Jr. and the two Bronx Council members are working off of a similar script, as was the case with rezonings in East Harlem and Far Rockaway. Diaz Jr. signed off on the city’s plan in November, granted the city meet certain conditions that he laid out in his non-binding formal approval in the Uniform Land Use Review Procedure (ULURP), a multi-step process that also involves non-binding votes by the affected community boards, which also approved it with conditions. The borough president said in his response that the city had “acted in good faith” in listening to the community’s concerns. But he maintained, “There is still more work to be done.” He called on the city to put in place a minimum of their monetary commitments before the rezoning is approved, an increase in the number of affordable housing units preserved to at least 2,000, enhanced enforcement of housing codes, the establishment of a new community center in Highbridge, and additional funding for improvement of parks and transit infrastructure. Jerome Avenue is also home to a large automotive industry, and Diaz Jr. urged the city to identify locations where displaced facilities could relocate as well as fund relocation, training, and certification for those businesses. Gibson has made similar demands. The city’s plan would only retain about 20 percent of the 151 auto businesses in the neighborhood, she recently told Gotham Gazette at City Hall, and she is pushing to retain at least 50 percent. Diaz Jr. also insisted that the city must address the school seat shortage in the district -- roughly 3,248 seats -- by identifying potential sites for new facilities. That is one of the biggest priorities for Gibson and Cabrera as well. Gibson said she and her Council colleague are pushing for two new elementary schools in school districts 9 and 10. “The challenge we face is we don’t have large parcels of city-owned land,” she said, emphasizing that the administration will have to work with private landowners to find suitable locations for new schools, while also expanding capacity at existing facilities that can bear it. Asked about the final stages of negotiations, a spokesperson for the Department of City Planning said in a statement, "We continue to work hand-in-hand with local elected officials and community leaders to build and protect affordable housing while also boosting economic vitality along the Jerome corridor."